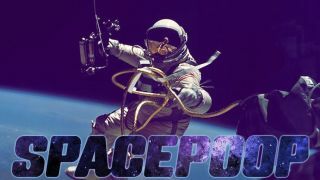 NASA's Space Poop Challenge has awarded $30,000 in prizes to space tech pioneers for their spacesuit toilet innovations. Turns out, space poop is a problem that puzzles thousands of people. After NASA asked for solutions to let astronauts urinate and defecate inside a spacesuit for up to six days, more than 5,000 entries (representing 20,000 people) answered the call. The winner of the $15,000 Space Poop Challenge prize was Thatcher Cardon, for a solution called "MACES Perineal Access & Toileting System (M-PATS)." Details on the system were not immediately available. Cardon explained how he devised the idea for the system. "Over time, the winning system of ideas coalesced," Cardon said. "Then, I packed up the family, and we drove around Del Rio, Texas, to dollar stores, thrift stores, craft stores, clothing and hardware stores to get materials for mock-ups." The second-place prize of $10,000 was awarded to a system dubbed "Space Poop Unification of Doctors (SPUDs) Team – Air-powered," by Katherine Kin, Stacey Marie Louie and Tony Gonzales. The $5,000 third-place prize went to Hugo Shelley's "Spacesuit Waste Disposal System." NASA scientists said they were pleasantly surprised by the public's interest in the challenge. "It was wonderful to see the global response from our crowdsourcing challenge," added Kirstyn Johnson, NASA spacesuit technology engineer. "We enjoyed seeing the innovative approaches that were sent in given such a demanding scenario. Others at NASA are now thinking about ways we can leverage a crowdsourcing approach to solve some more of our spaceflight challenges." The contest opened in October and invited participants to create a system inside a spacesuit to flush away urine, feces and menstrual fluid. The goal is to make the system function for 144 hours — long enough to keep an astronaut alive for a rescue if his or her spacecraft were to be disabled and out of breathable air. NASA astronauts' current method of waste disposal involves using a diaper during spacewalks and launch and entry, but these systems can be used only for about a day. The agency noted that it is difficult to design pooping systems for microgravity, where fluids and other things float. Maintaining good hygiene for these systems was among the primary challenges participants were tasked with solving. In a description of the challenge, NASA said it was looking for technologies that have a "technical readiness level of 4" on its "ready for flight" scale, meaning that the solution could be tested in one year and be ready for space in three years. NASA added that it would consider solutions that would need more time if they were considered breakthroughs. The goal is to use the system on a mission in the next three or four years, the challenge page said.